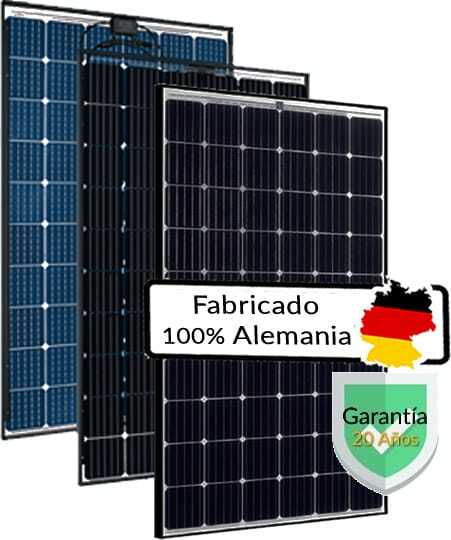 German solar panel sale Solar World, with 20 years of Guarantee. We are official distributors. We have own stock available, at the best price, in our warehouses in Valencia (Spain). We distribute to France, Greece, Hungary, Spain, Portugal… and the rest of countries of Europe and worldwide. Unlike most other brands that simply assemble or have a German name, SolarWorld solar panels are 100% made in Germany, being the first manufacturer of pv modules in the world to have product guarantee of 20 years and positive power tolerance 0 / + 10W. SolarWorld modules are recognised as the best quality solar for all pv professionals. The performance reached with this brand is higher than any others solar panel brands present in the photovoltaic market. German solar panels, made in Germany from cell to final solar panel product. Reinforced frame corners with exit hole for water and dirt. Available with Monocrystalline (PERC) and Polycristalline. Suitable for On-Grid and Off-Grid pv-systems. 33 mm aluminum frame with wavy profile for greater strength and lower weight. Included in the Bloomberg Tier 1. First position in the PV+Test made by TÜV with 93 over 100 possible points. The SolarWorld photovoltaic module manufacturing center is located in the university town of Freiberg. Freiberg has a long history of producing semiconductor circuits. Here are located all the stages of the production, from the silicon to the module. Always in direct contact with the research and development company SolarWorld Innovations, owned by the consortium. Likewise, the relationship with the Freiberg Technical University and the Semiconductor Center in Dresden creates a climate of innovation among its various specialists and competent professionals. Why purchase SolarWorld solar panels? 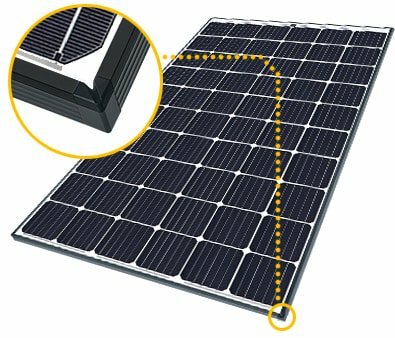 SolarWorld panels have their corners reinforced with ASA. A type of plastic that is used in automotive technology and with great physical resistance and to UV rays. In addition to this, the groove that they present in the corners, decisively facilitates the drainage of water and the cleaning of the panels. This is very important throughout the life of a panel. Over the years, the dirt accumulates in the corners of the panel, this can cause, and in fact happens in most of the panels, that the cells of the corners are partially covered, affecting very negatively the performance of the pv panel . All SolarWorld solar panels already incorporate this ASA piece in the corners to minimize dirt buildup. The frame that incorporates the SolarWorld panels does not consist of a single sheet of aluminum, as is usual in the vast majority of manufacturers. 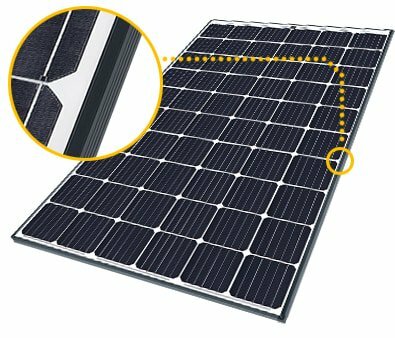 The frame of theSolarWorld panels consists in a flat aluminum tube, reason why its resistance is very superior to many of other manufacturers. An example of the extraordinary strength of SolarWorld modules can be seen in the image on the right, this is one of the resistance tests that SolarWorld submits to its modules and that far exceed the requirements of the IEC standard. You probably have never seen anything like it on another solar panel on the market and all SolarWorld panels like this feature. This is, among other things, to reduce also the losses caused by the accumulation of dirt. In addition to this, SolarWorld photovoltaic panels, with this separation andtechnology applied in manufacturing, are free of PID effect. Its translation is Induced Potential Degradation. This negative effect happens when connecting long strings of panels, then conduction can occur between the cells of the panel edges and the panel frame, so the performance of the panel is reduced dramatically. It is important to emphasize the PID effect and that a great majority of manufacturers that certify to be free of PID, is not reliable, as evidenced in the PID test carried out by the German laboratory Fraunhofer, where tested several brands of recognized prestige and only one handful of them passed the test successfully, many of them resulted in a “junk panel” we could call. Only those panels that are subject to the continuous control of their production, as in the case of SolarWorld, can give us the peace of mind that all the panels that we are going to install will be free of the PID effect. Together with the cells, the junction box is the most important part of the panel. Incorrect encapsulation can lead to overheating by-pass diodes, which can lead to the production and performance of the panel. In the case of SolarWorld panels the junction box is unique and patented. The highest quality silicone is used and a uniform distribution inside the box for better heat dissipation. This makes the behavior of the by-pass diodes always reliable. All you have to do is lift the lid of the junction box of a SolarWorld pv module to see it and notice the differences with other brands. In addition to this, the connectors used are Amphenol H4, which are compatible with any certified solar cable on the market. In addition to the features shown, the qualities of SolarWorld solar panels go much further. You can download more information in the document: SolarWorld Quality Dossier, in which you can consult other quality characteristics tested in the laboratory. SolarWorld is one of the few solar panels manufacturers in the world that have the TÜV Power Controlled certificate. This certificate serves to ensure that all SolarWorld solar panels have the power indicated by the panel and that there is no possibility of fraud in it. The process is carried out as follows: The German TÜV Certifier periodically visits the facilities of the SolarWorld factory at each visit, collects samples of the manufactured solar panels and verifies that all of them have the electrical characteristics declared by the manufacturer. What is achieved with this is to have the absolute certainty that when you purchase a SolarWorld solar panel, it is a safe purchase. This certificate should always be demanded from a manufacturer, otherwise we run the risk of fraud in the purchase of solar panels. Sometimes, there are manufacturers that falsify the data of the documents of the solar plates, being their power smaller than the one that is declared, this is a more habitual practice of the desirable thing in solar plates of Asian origin and for that reason the importance of always demanding this certificate. With SolarWorld panels you will be always 100% safe. 1.3 Why purchase SolarWorld solar panels?